SOMETIME AFTER MOVING TO NEW YORK from the Midwest in the late ’80s, BRENDA R. NEVILLE joined a dance troupe whose focus was international dance. As part of All Nations Dance, her specialties were flamenco and Argentine tango, and she learned other world dances from her colleagues, each of whom had a specialty. Together they traveled the world, dancing and acting as cultural ambassadors. “My repertoire of world dance grew very large,” she says. By 2005, when the troupe disbanded, Neville had been dancing with them for 15 years. She felt the mission — to gain and share understanding of different cultures through dance — was so important that she founded Neville Dance Theatre in Clinton Hill to be what All Nations Dance had been, with an underlying focus on ballet. She choreographed a modern version, updating it to the present day. Presented in collaboration with LIU’s Kumble Theater for the Performing Arts, The Nutcracker will run Dec. 18, 19 and 20, at 7:30 p.m. all days with a 3 p.m. matinee on Dec. 20. 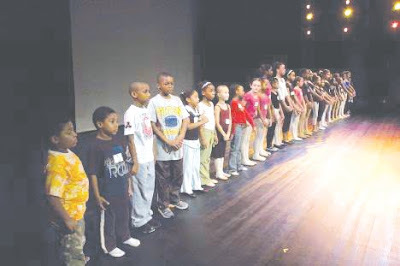 Neville dancers and several auditioned young New Yorkers will perform the ballet, set in Clinton Hill and Fort Greene, embellished with Capoeira and Argentine, Middle Eastern, Chinese, Philippine, Irish dances, among others. How are the youngsters enjoying rehearsals? “They love it!” she says. Most are between the ages of 7 and 10, plus several older girls. With this show, Neville launched the “ticket sponsor program,” through which patrons can donate the cost of a ticket, $35, to the Boys and Girls Club and other organizations so students can see the show for free. So far, 20 kids will be attending a show in this way. She is also developing their chance programs, “chance to dance” and “chance to advance,” the first of which provides dancers an opportunity to learn about different styles, work with a professional company and to have stage experience, and the second of which is a mentorship program for adults. For more information or for instructions to purchase tickets visit www.nevilledance.com or call Kumble Theater at Long Island University’s Brooklyn Campus at (718) 488-1624. Two of the show’s actors — DOUG THOMPSON, who plays Billy, and TYLER ADCOCK, who plays Bobby — live in Brooklyn. Children attending Dear Edwina will have their own chance to ask Edwina for advice by placing letters in a special box in the DR2 Theatre lobby. Each week, one child’s “Dear Edwina” letter will be selected, and Edwina’s reply will be posted on the show’s web site: www.DearEdwina.com. Tickets for the show are $39 and are available at the show’s web site or by calling Telecharge at (212) 239-6200. Tickets may also be purchased at the DR2 box office, 103 East 15th St. Group rates are available. This production is 60 minutes long and is recommended for ages 5 to 12. The show has been running since mid-November and will continue until late January.